Who is Ego the Living Planet ? Who is Ego the Living Planet? Ego is a Marvel character that is actually living, thinking planet. Ego was created by as an adversary for Thor by Jim Starlin and Stan Lee. While generally associated with Thor, Ego is set to appear in the film Guardians of the Galaxy 2. Ego will have a humanoid form and be played by Kurt Russell. It has been rumored that Ego will be Star-Lord's father. Galaxy: While capable of moving Ego generally lives in the Black Galaxy. A few origins have been suggested as to how Ego came to be. Initially, he says that a mind of a scientist was somehow merged with that of a planet. Ego begins to consume space ships and wanderers to his planet. An alien race, Rigellians begin to fear Ego and enlist the help of Thor to meet the deadly living planet. Thor defeats the planet, and forces Ego to renounce its plans for galactic conquest. Ego vows to never again leave the confines of the Black Galaxy. Ego is driven and insane and once again begins attacking world. This time he is stopped by Thor, Galactus, Firelord and Hercules. 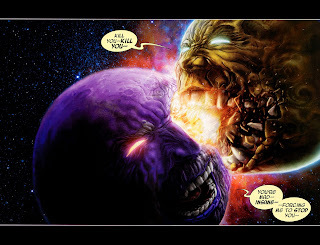 Galactus attaches a massive spaceship engine to Ego that pulls him safely through the galaxy away from other worlds. However, this plan goes awry when Ego gains control of the engine. He seeks vengeance and goes to Earth where he battles the Fantastic Four. Ego does massive devastation to Earth but is beaten. This event is later erased by a reality warping mutant. In one story, Beta Ray Bill also faces off against a rampant Ego. Ego learns that he is actually one of two living planets created by the Stranger. The other planet is called Alter-Ego. Alter Ego has been held captive in the museum of the Collector. Ego goes to free his brother only to learn that Alter Ego was designed to confront Ego. Ego manages to defeat to Alter Ego but before he can kill Alter Ego he is stopped by Thor. Fragments of Alter Ego now travel in a orbit around Ego as a Moon. Egp hired Rocket Raccoon to kill off aliens that acted as head lice to the Living Planet. Can shape its entire surface to address beings, talk, create sensors, arms and tentacles. Ego has a brain, digestive and circulatory system built within the planet. Ego will be played by Kurt Russell in Guardians of the Galaxy 2. It has been suggested that Ego could both be the primary villain and Star Lord's father in the sequel. 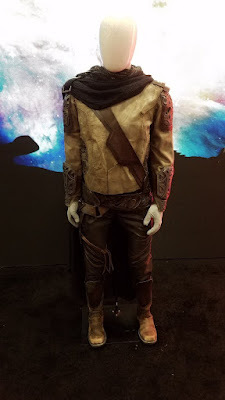 The costume for Ego shown at San Diego Comic Con revealed that Ego will have a humanoid form.